Ok, so hopefully im not screwed because im a student and cant afford my insurance going up! 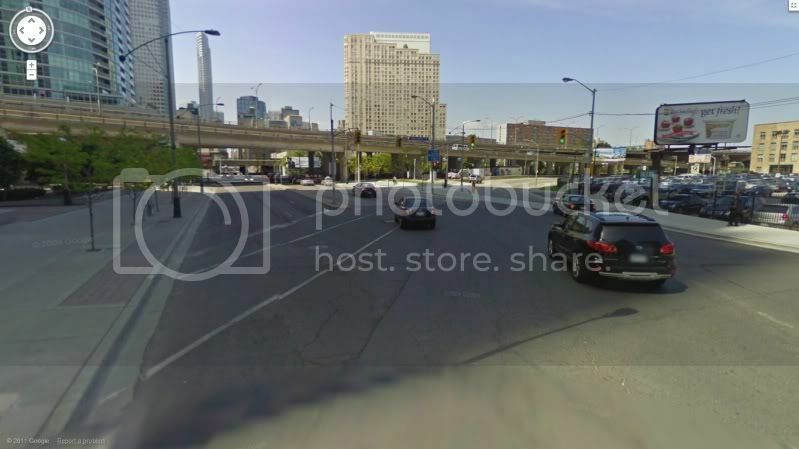 Anyways, my story is im going eastbound on Harbour St. Getting off the Gardiner Expressway East ramp, I approach a sign that points to Yonge St. North. So I get in that lane, which is the far left lane. Then all the sudden on the left side a yellow sign that says "Left Lane Exits". 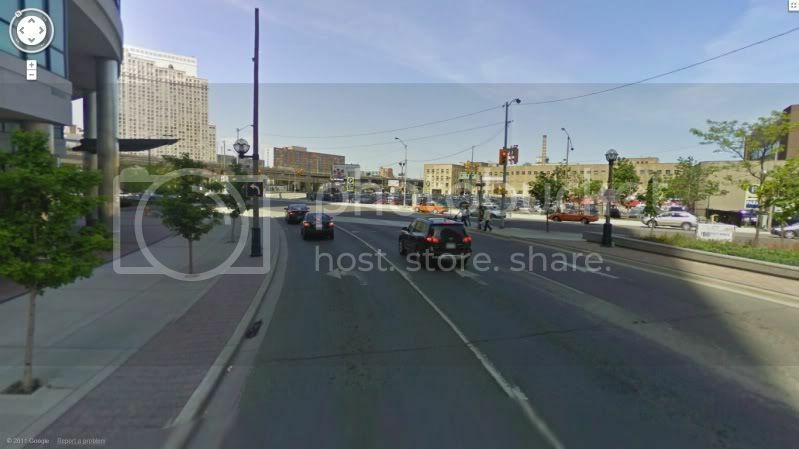 So immediately I get into the right lane, closest to the left curb lane to avoid getting off my route to go northbound on yonge st. Anyways, as I approach this intersection, in my opinion, I did not see any signs that forbade continuing forward. 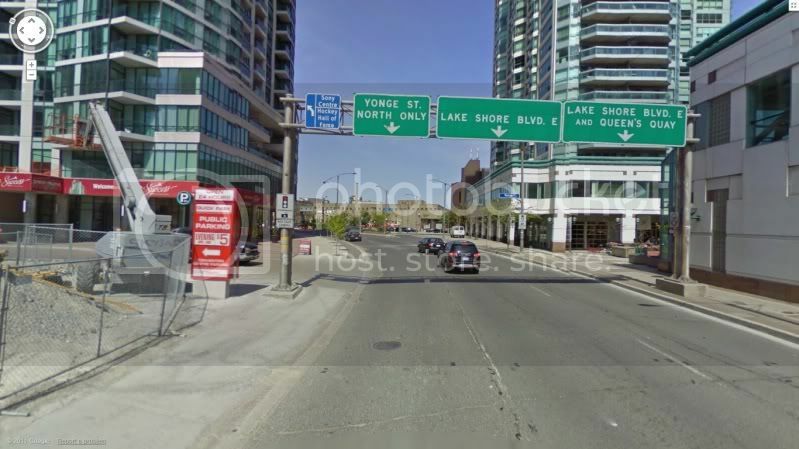 I believed I was in the correct lane to continue North on yonge because of the "Left Lane Exits" sign indicated. I have included some pictures of the intersection I was at. Again, I was in the right lane, closest to the left curb lane. Do I have any chance to fight this ticket? What kinda approach should I take? Such an innocent mistake, I have a Canadian Border Services Officers Test this Tuesday, this is not what I need! I don't understand what you did. 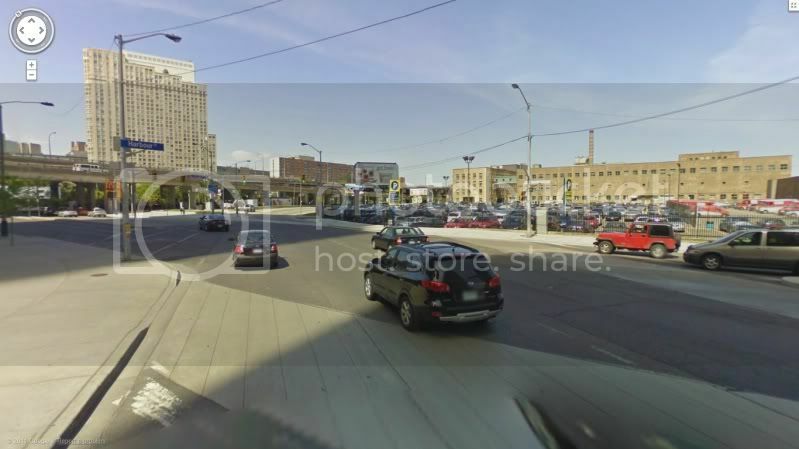 "Continuing forward" would put you onto Lake Shore, you can't continue forward onto Yonge St because that is perpendicular to Harbour St. Did you make a left turn onto Yonge from the centre lane? Or did you continue forward onto Lake Shore and get a ticket for doing that? Thank you very much for the reply. I was in the lane next to the left curb lane, and I made a left hand turn onto yonge st., not realizing I was in a inappropriate lane. 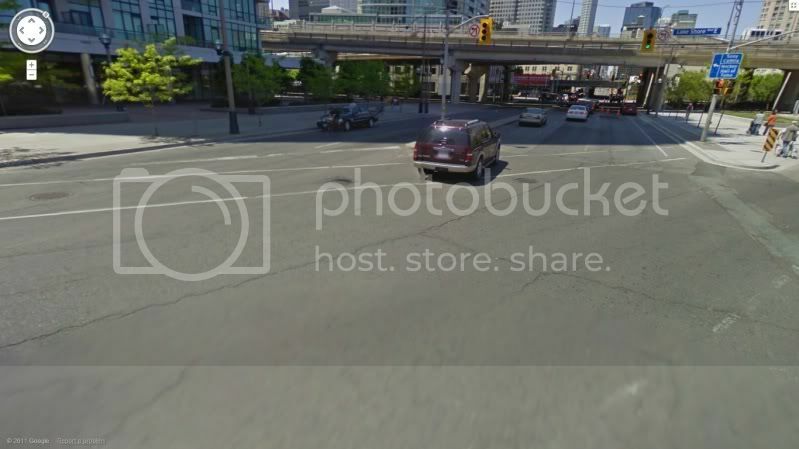 Because the sign before that intersection said "Left Lane Exits," where I was originally in the left curb lane, I changed lanes in order to not veer off my path to yonge. The signs really confused me, the whole street/intersection is a disaster. I made the left and the officer must have been on the sign walk, he walked out into the middle of the lane and pointed at me. This is where the nightmare begins, I swear you try your hardest to be a good citizen in Toronto, but one small misunderstood mistake and your getting penalized hard immediately. The joys of living in this damn city. Okay, I get what happened. Seems like a language or logic issue. You thought you were "continuing" onto Yonge, where in fact you could only exit onto Yonge as Harbour continues to Lake Shore. 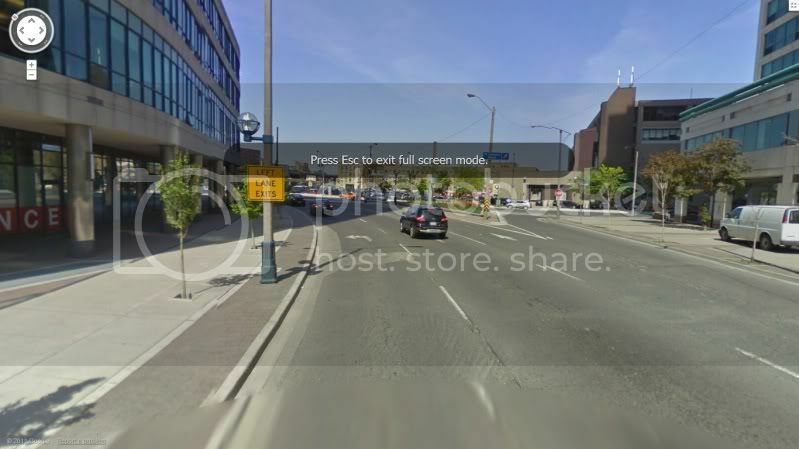 This is what the yellow sign means when it says "Left lane exits" - you are in that lane to exit onto Yonge. You then made what is basically an improper left turn from the centre lane. As for the charge itself, if this is the bylaw disobey sign, as far as I know there are no points associated and it is very unlikely to impact insurance if it is your only conviction on file. Sorry if I didn't outline the scenario properly, not used to describing these types of situations haha. 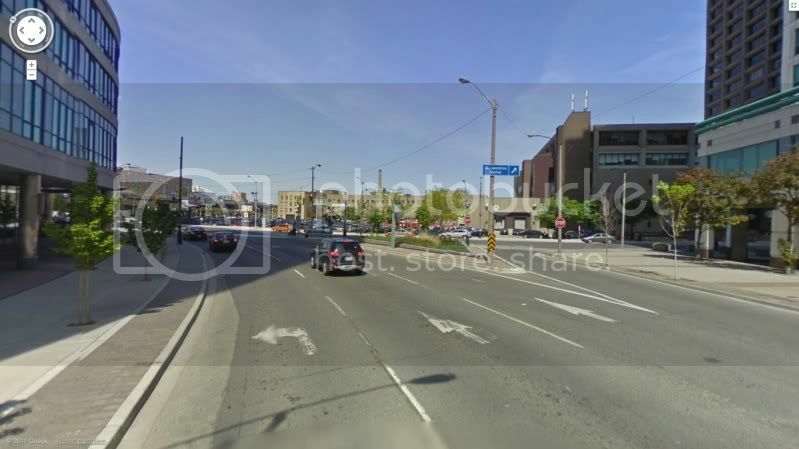 So ya you guys get the drift of the story, in my opinion that sign seems misleading, especially because there is a sign prior to the cautionary sign that says "Yonge St. North" and then a couple meters down the street it says "Left Lane Exits." To me it just seems misleading, I was already in the lane intended to go North on Yonge, until I saw that sign which lead me to believe that the lane was about to abruptly end and possibly turn off into a condominium or something. Anyways, definitely not a by-law infraction, 182(2) under the HTA. I unfortunately have 1 speeding ticket last year, 15KM/H over, just a fine and no demerit points on my record. I'm looking at hiring a paralegal, most likely Trafficticketsolutions.ca. Anyone have good experience with them? Does the intersection still look as Google Street View has it, i.e., no actual black and white signs to designate lane usage? If so, you might be able to beat the charge as there were in fact no signs to disobey. Squishy wrote: Does the intersection still look as Google Street View has it, i.e., no actual black and white signs to designate lane usage? If so, you might be able to beat the charge as there were in fact no signs to disobey. I only see one black-and-white sign designating the left lane as a turn lane only. The OP used the centre lane which is not designated by any enforceable sign, as far as I can tell. Only a painted arrow within the lane itself. Squishy wrote: I only see one black-and-white sign designating the left lane as a turn lane only. The OP used the centre lane which is not designated by any enforceable sign, as far as I can tell. Only a painted arrow within the lane itself. I had been looking for a cluster of those signs and missed the lone sign for the left lane, that's why my earlier post was worded oddly as if no signs existed at all. Just to clarify... I think the actual offence you committed was an improper turn and not disobey sign. 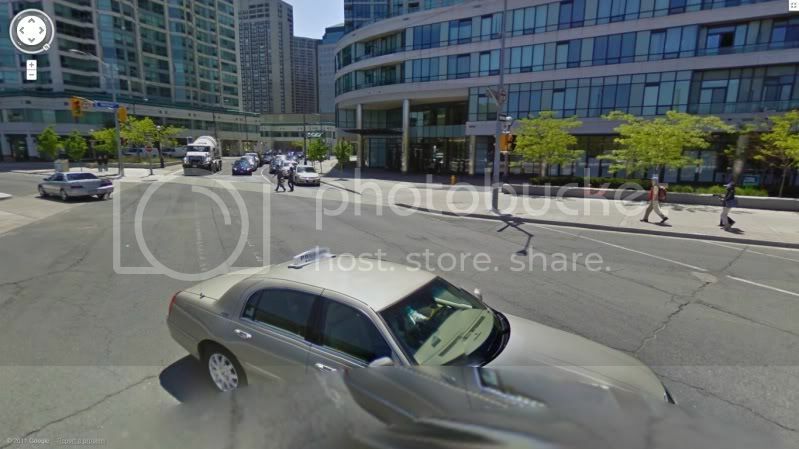 The "directional" (overhead) signs that are in the picture are for information only... unless there are actually other signs at Harbour and Yonge. (Don't think there are.) Were you charged with "disobey sign", contrary to section 182 (2) of the Highway Traffic Act? Hey guys, sorry for the late reply. I was in fact charged with Disobey Sign under sec. 182 (2). The intersection still looks exactly as google street maps shows, nothing has changed. I hired a paralegal, from trafficticketsolutions.ca... Hopefully they recognize that this is possibly an improper ticket to issue me? If you've provided all of the information to your paralegal, they should be able to fix it for you. Then again, they might see something that I don't, so I might be wrong... anyway I think you've chosen a good option and they should be able to at least get a lesser offence for you, if anything.